2016 June Mini-Sessions - Ballet Arts Centre of Winchester, Inc. Classes are open to NEW and returning students! These workshops meet once a week for three weeks in a row, and offer dance plus a whole lot more! Join Us For Our 3 Week Summer Dance Workshops! Join Sleeping Beauty, Cinderella, and the rest of your favorite dancing princesses! 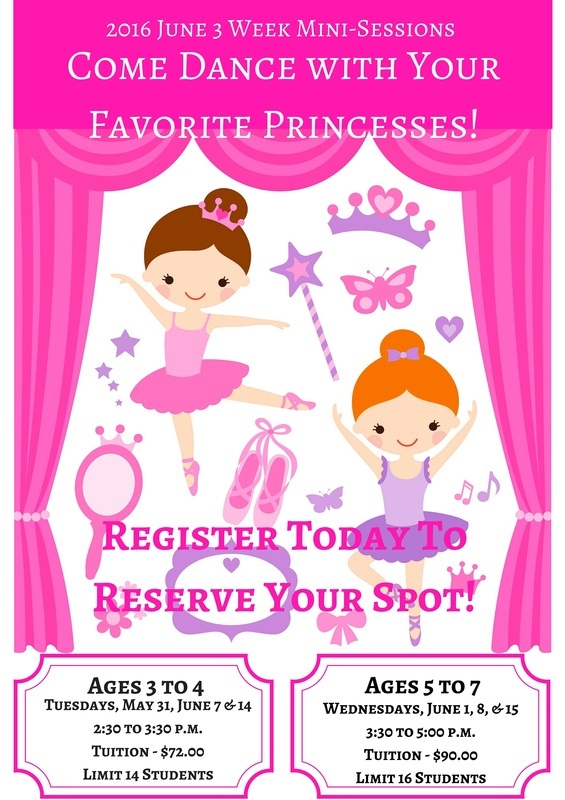 Each class will include ballet plus projects that explore the world of the princesses and all of the things they love! Meets Tuesdays, May 31st, June 7th & 14th ...3:30 to 5:30 p.m. This session introduces the basics of Hip Hop and Modern dance. Parents are invited to view a Rep performance during the last class of the session. Meets Wednesdays, June June 1st, 8th, & 15th …4:00 to 6:00 p.m. This session is for older student with some dance experience and technique. It will allow the opportunity to continue training while exploring new styles of dance. Students will work towards creating their own pieces to be shown during the last class of the session. For upper level students who wish to maintain strength and technique. These sessions will consist of class plus repertory to be presented on the last evening of class. Meets Tuesdays, May 31st, June 7th & 14th …5:00-7:00 p.m. Meets Wednesdays, June 1st, 8th, & 15th …5:00-7:00 p.m. Contact the BAC office at 781-729-8556 for more information! All classes are subject to sufficient enrollment. Tuition is non-refundable after May 14th, 2016.